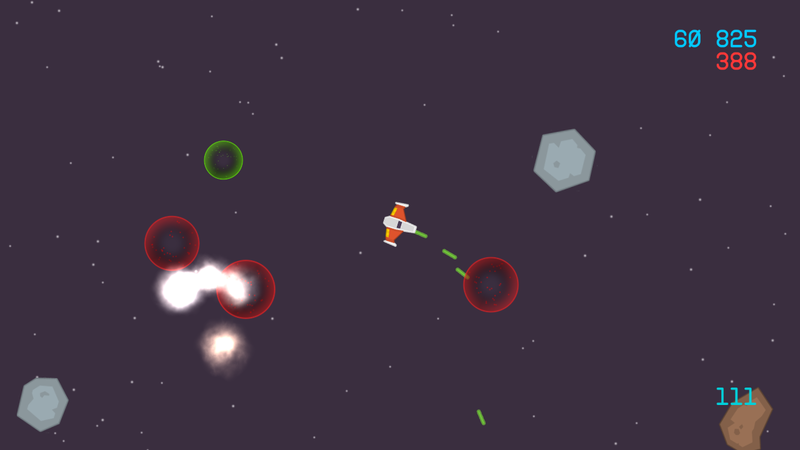 Laser Asteroids is a classic 2D space shooter based on the original idea of Asteroids game from 1979. It comes in nice colorful style and with new features and awesome music. Basic enemies are two types of meteors and Kamikaze UFO. Brown Meteor - Needs just one hit to be destroyed. Grey Meteor - Needs two hits to be destroyed. 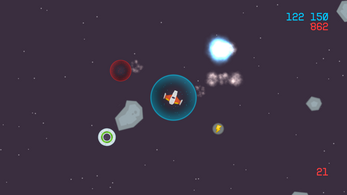 Kamikaze UFO (神風UFO) - Needs two hits to be destroyed and its speed is much faster. When laser blasted down or destroyed by green or red shield then casts huge explosion (see Bomb). Bomb - Casts huge pulse explosion that destroys everything too close. Player can get some damage too! Blue (Player) Shield* - Creates a shield around player providing temporary protection against all impacts (I'm invincible!). More rare than other kinds of shields. Red (Distance) Shield* - For a limited time creates a smaller shield at the position where item has been hit. Green (Moving) Shield* - Creates a small moving shield that fly around in random direction and destroys everything that touches except the player until it lefts the screen. Moving speed could be rapidly accelerated by a bomb pulse (see Bomb). Red Pill - Restores health by 25 points. Medikit - Restores health by 50 points. 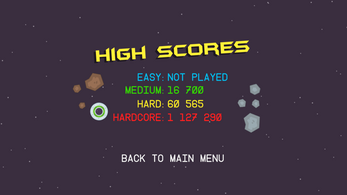 Rare Meteor Fragments (4 color types) - Add score bonus based on its color. *) When a shield touches another shield both are immediately destroyed. 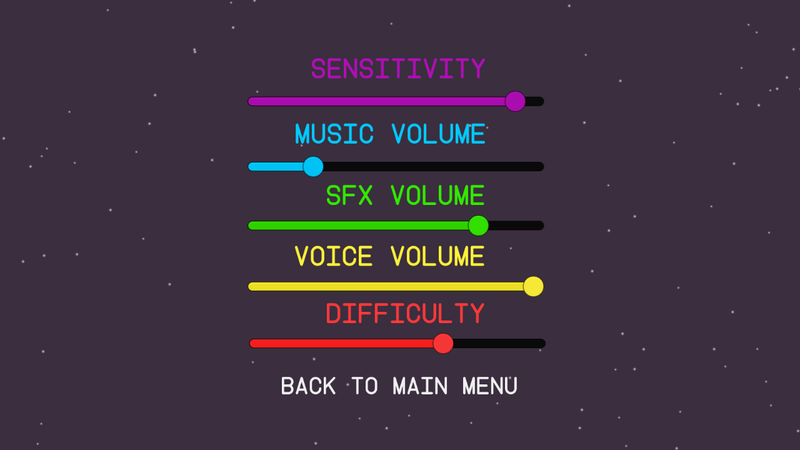 Laser Asteroids allows you to set the speed of rotation (= sensitivity of accelerometer on Android version), music, sfx and ship's computer voice volume interdependently and pick one of the four difficulty levels. 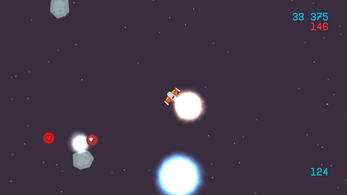 Bigger difficulty means bigger damage range, slightly faster meteors spawning but also more score points. 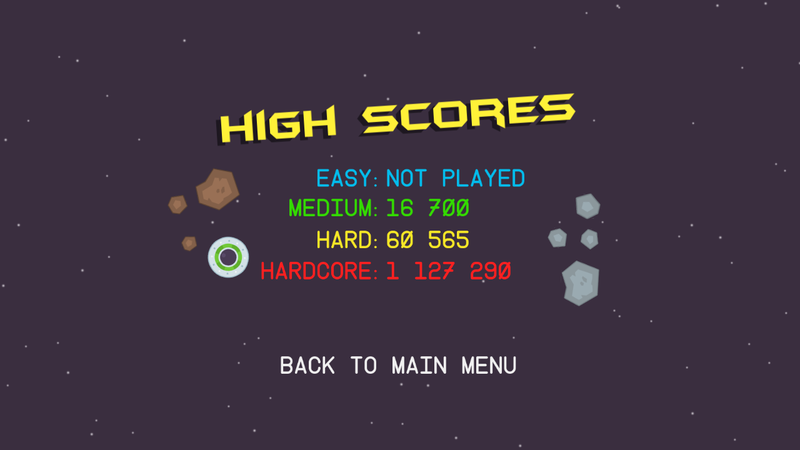 Each difficulty level has it's own high score holder. Nik who's been making juicy music for the game recently released all three tracks at SoundCloud. Do you like it? I do. What's the difference between PC version and Android version? 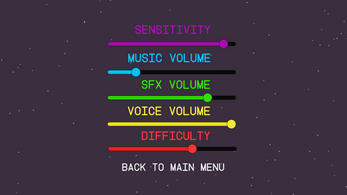 While PC is played with keyboard (left and right arrows + space key) in Android version an accelerometer* is used to rotate ship and you can shoot by a single tap anywhere on your display, which is more fun and gives you ability to shoot faster using two fingers.